Flour and Breads and Their Fortification in Health and Disease Prevention, Second Edition, presents the healthful benefits of flours and flour products and guides the reader on how to identify opportunities for improving health through the use of flour and fortified flour products. 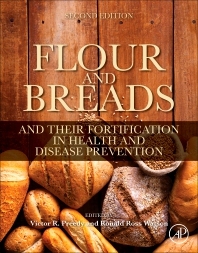 The book examines flour and bread related agents that affect metabolism and other health-related conditions, explores the impact of compositional differences between flours, including differences based on country of origin and processing technique, and includes methods for the analysis of flours and bread-related compounds in other foods. This revised, updated edition contains new research on diverse flours with an emphasis on nutrients and nutraceuticals as supplements, thus making this content a timely reference for both nutritionists and food scientists. Dr Vinood B. Patel is a Senior Lecturer in Clinical Biochemistry at the University of Westminster and honorary fellow at King’s College London. He presently directs studies on metabolic pathways involved in liver disease, particularly related to mitochondrial energy regulation and cell death.